When it comes to getURLs and Projectors, do these questions come up time and time again? How can I open a browser Window without any toolbars? Why don't the web links work in the Projector file? How can I create a specific-size window? How can I create a non-resizeable window? Now you can look to FlashJester for the answer. 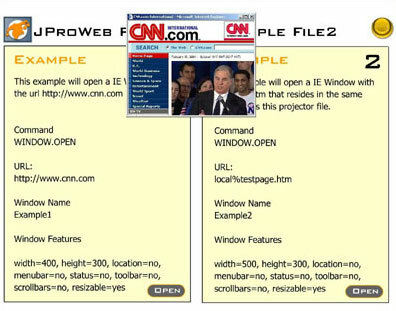 The new JTool, JProWeb, is here to solve all of your browser window problems. FlashJester's collection of JTools pump up the performance of your Projectors. These tiny add-ons allow you to add features that Macromedia left out! So let's tell you more about the latest, JProWeb.